Mass production of oil didn’t begin until the mid-1800s. Sporadic discovery and production occurred from the 1850s to 1900s. One of the most significant oil discoveries in Texas was the Spindletop oil field on January 10, 1901. The oil field was found just south of Beaumont in eastern Jefferson County. It was the first successful well, as it produced an estimated 75,000 barrels of oil per day. Its peak production was achieved in 1902 when the well produced 17.5 million barrels. The Spindletop oil field helped transform the Texas agricultural economy to an Industrial Age, petroleum-driven economy. One of the biggest and historically significant oil discoveries was the East Texas Oil Field, which is the second largest oil field in the United States. The East Texas Oil Field covers parts of five counties in East Texas. At the beginning of 1911, several attempts were made to produce oil in the East Texas Oil Field. However, production failed because the oil in this field was deeper than other successful fields and the drilling technology wasn’t advanced enough to extract the oil. But this all changed in October 1930 when the Bradford No. 3 well struck oil at a depth of 3,536 feet below surface, where sufficient oil reserves were finally reached. Shortly after, another well was completed nine miles north of the Bradford No. 3 well, which also hit oil. This well produced 22,000 barrels per day. Later, another well was completed 25 miles north of the Bradford No. 3 well, which produced around 7,680 barrels of oil per day. It soon became obvious that all these wells were producing oil from the same reservoir, a remarkable discovery as no field of this size had ever been found before. Starting in 1905, the taxation on the oil industry was implemented in Texas. The industry growth became an important source of tax income for the state. At the beginning, the tax was only 1 percent of the product value. During the first full year of taxation (1906), the state collected more than $100,000 in revenue. Public revenue varied on production levels and tax rates throughout the years. In 1919, the total taxes collected were more than $1 million and a decade later, tax income exceeded $5.9 million. Natural gas was discovered as a by-product of oil production in Texas during further development of North Texas. In 1918, the first gas well was completed. The well production was estimated at 10 million cubic feet of natural gas per day. Later, additional wells were completed, and one of the wells was producing 107 million cubic feet of gas, which confirmed the presence of natural gas fields in Texas. By 1927, the natural gas production exceeded 4 billion cubic feet per day. By 1994, gas production in Texas was more than 8 trillion cubic feet per day. If Texas was a separate country, it would rank as the 15th largest oil producer in the world, putting it among Kuwait and Venezuela. 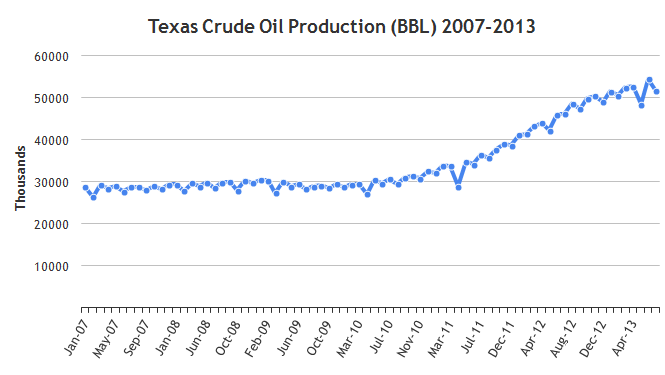 Oil production in Texas is growing rapidly. In March 2013, the total oil production was 74 million barrels, which is double the production levels in 2009, according to the U.S. Energy Information Administration (EIA). Such production levels have become possible through improved hydraulic fracturing and horizontal drilling technologies. Most of the oil in Texas is produced in the Permian Basin and Eagle Ford Shale. Today, Texas is a major player in the oil and natural gas industry. Texas holds 23 percent of America’s natural gas reserves. According to the EIA, production per plant has increased even though the total number of production plants has decreased in Texas. 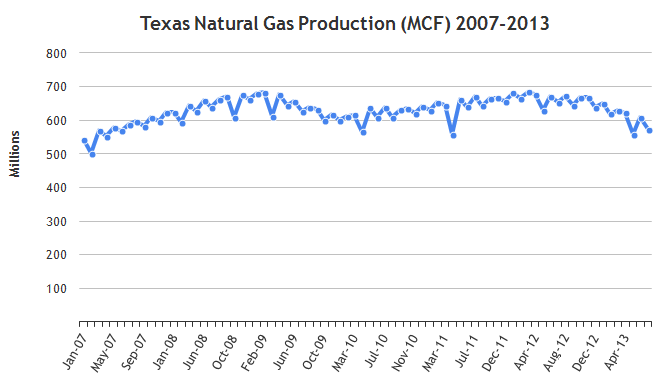 In 2009, the total production of natural gas was around 19.7 trillion cubic feet of gas per day, making Texas the largest producing state in the United States. Natural gas makes up 14.9 percent of gross state product in Texas and has contributed over $100 billion to the state’s economy. The industry employs over 312,000 Texas residents. 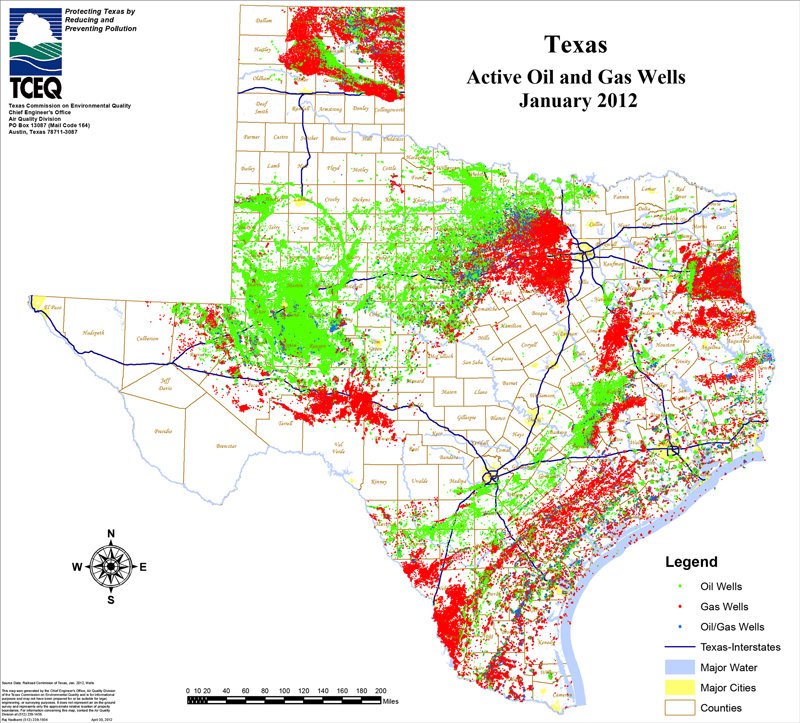 The total number of wells in Texas is 262,000 as of 2009. Of those numbers, there are 141,000 oil wells and 121,000 gas wells.